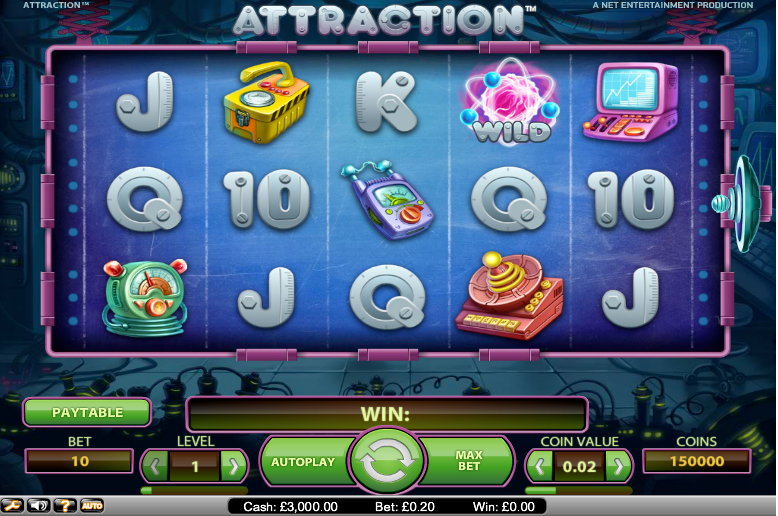 The Attraction slot machine is a more than worthy game for a quick punt. Netent have created a title with an innovative game feature and a great look and feel to boot. The art style, music, and inclusion of the magnetic re-spins all complement each other creating a solid title that will surely win plenty of fans. In terms of specifics, Attraction is played over a five reel, three row grid. There are 10 fixed win lines and the maximum pay-out is 500x the initial line bet. If you’re a fan of futuristic scientific stuff, you’ll most likely get a kick out of Attraction. Let’s take a closer look. Innovative game features. The magnet re-spin bonus is a great addition to the title. Solid appearance and feel. The futuristic soundtrack complements the action well with the bass-driven, funky tune providing the perfect accompaniment. Massive return-to-player rating. 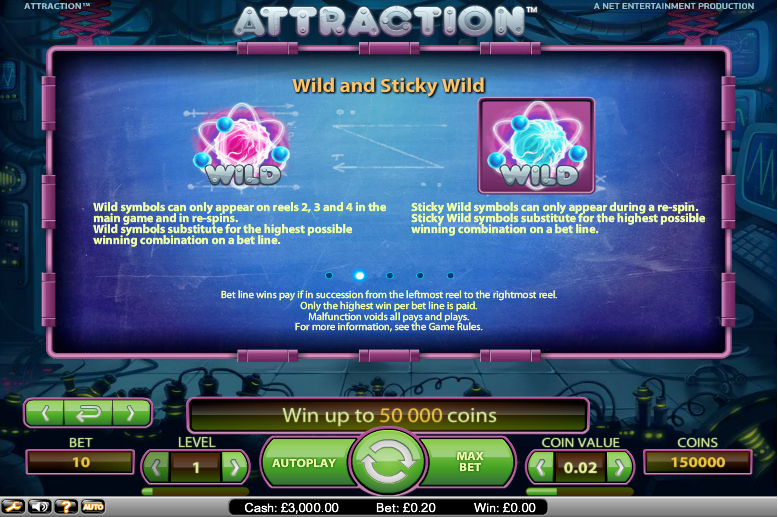 At almost 97%, the Attraction machine is right up there with the most lucrative online slots. 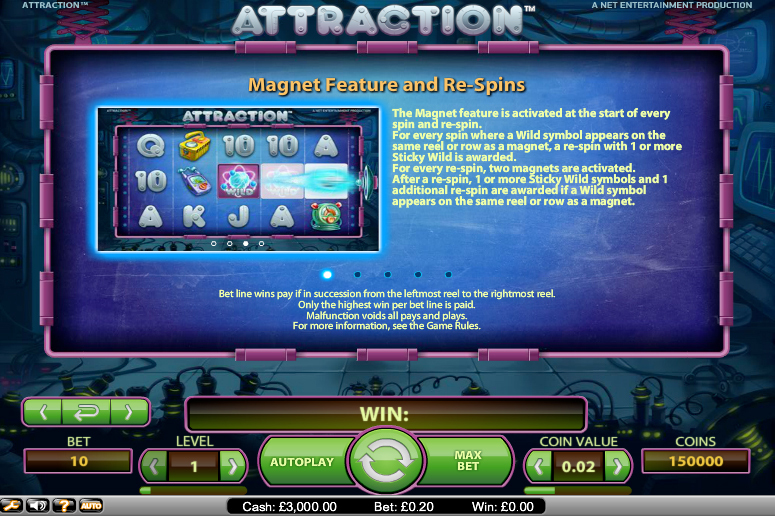 Although the main feature of the game (the magnet re-spin) is innovative and something we’ve not seen before, the lack of a second screen bonus or free spin mode limits the replay value of attraction. Red Satellite Machine = 500x the line bet. Purple Monitor = 300x the line bet. Yellow Machine = 250x the line bet. Green Machine = 200x the line bet. Blue Machine = 150x the line bet. “Wild” symbols can only appear on reels two, three, and four in the main game and during re-spins. “Wild” symbols substitute for the highest possible win combination on a winning line. The sticky “wild” symbols can only appear during a re-spin. Sticky “wild” symbols substitute for the highest possible winning combination on a win line. The Magnet Feature is activated at the start of every spin and re-spin. For every spin where a “wild” symbol appears on the same reel or row as a magnet, a re-spin with one or more sticky “wilds” is awarded. For every re-spin, two magnets are activated. After a re-spin, one or more sticky “wild” symbols and one additional re-spin are awarded if a “wild” symbol appears on the same reel or row as a magnet. 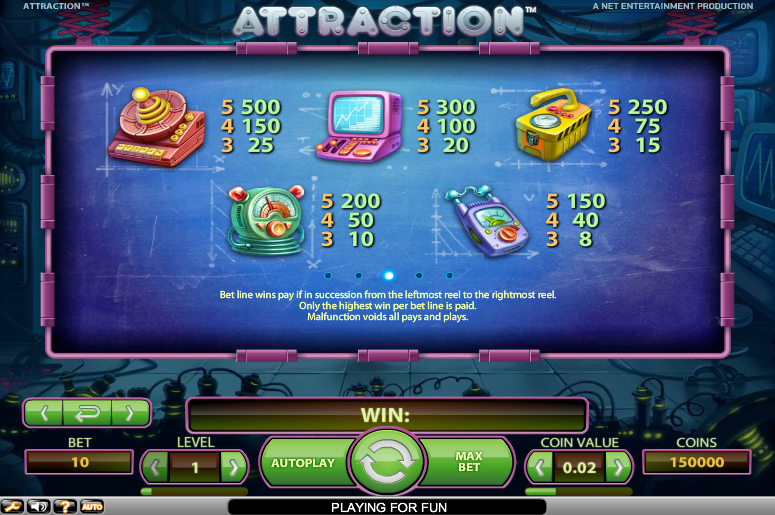 The number of win lines is fixed at ten on the Attraction slot. Players are therefore only able to adjust the value of each coin and how many are bet on each of the lines. They can bet between one and ten coins per line, and the maximum and minimum values are £1 and 1p respectively. This means, with all values set to their lowest, the minimum cost per spin on Attraction is just 10p. Meanwhile, with all variables maxed out, the highest price of each play is £100. This should be more than enough to satisfy all but the very highest rollers around. All told, the Attraction slot is a decent machine. It’s somewhat lacking in the feature department but the one that it does bring to the table is innovative and makes the game feel fresh on a first visit. That said, the omission of a true second screen bonus, or even free spin mode will limit the enjoyment a player can glean from the title during repeat visits. Despite the lack of variety in gameplay, Attraction is still likely to win plenty of fans thanks to its highly generous 96.7% return-to-player rating. This game has a rating of 4 / 5 with 458 total reviews by the users.